Black seed cures every disease but death itself. We have two types of black seed oil, an Egyptian oil and an oil made from Egyptian seeds but not grown in Egypt. The potency is the same but the taste is slightly different. The oil is available in gelcaps, amber glass bottles (in five sizes), and stable plastic that does not allow the penetration of light. There are also many personal care products made with black seed oil, these ranging from lip balm to anti-aging skin preparations. 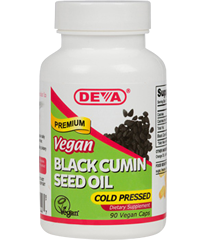 Black Cumin Seed Oil, 90 Vegan Caps, 500 mg.
Black cumin is revered throughout much of the world where it is used as a culinary seasoning as well as in traditional medicine. What is unique about this particular oil is that it is thoroughly vegan. Not many companies use vegan gelcaps so this is a going to suit some users better than the other options. Please note that the capsules do contain a little organic orange oil and silica! Contains: Each capsule contains 500 mg. of cold pressed Nigella sativa oil in vegan capsules (made from cellulose) with organic orange oil and silica. These products are registered with the Vegan Society and are free of animal ingredients. The capsules are free of yeast, soy, wheat, gluten, starch, sugar, salt, hexane, dairy, egg, fish, artificial color; animal products, byproducts or their derivatives. Black Seed Oil, 16 oz. This oil can be use as a dietary supplement or ingredient in cosmetics or herbal infusions. One teaspoon daily, preferably with meals. A 16-ounce bottle, approximately 480 ml., can be expected to last about three months at the dosage suggested. Contains: 100% pure cold pressed Nigella sativa oil from organic seeds. Black Seed Oil, 32 oz. This oil can be use as a dietary supplement or ingredient in cosmetics or herbal infusions. It is bottled in amber glass. 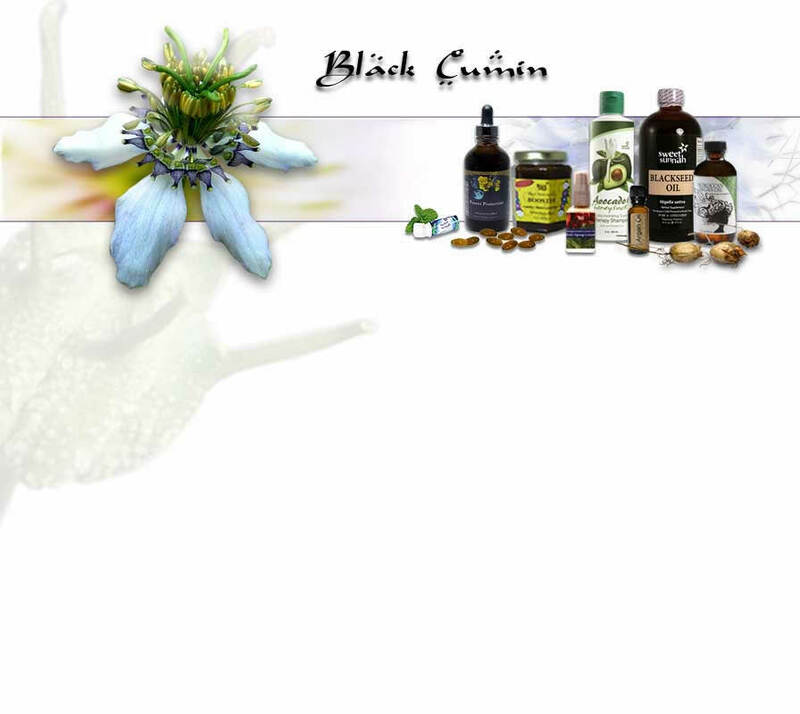 Black Seed Oil, 4 oz. This oil can be added to salad dressings, yoghurt, cottage cheese, smoothies, green drinks, or cooked cereals. One teaspoon daily, preferably with meals. A four-ounce bottle, approximately 120 ml., can be expected to last +/- 25 days at the dosage suggested. Contains: Pure cold pressed Nigella sativa oil from organic seeds. This item is sometimes a special order and may take slightly longer to ship. Egyptian Black Seed Oil, 16 oz. Though the chemical composition of both Egyptian and other black seeds is the same, the flavor of the Egyptian oil is milder. For oil pulling, use a spoonful or add some Black Seed Oil to another oil to increase the medicinal benefits. Storage: May be kept refrigerated or stored at room temperature, keep away from heat or direct sunlight. Contains: 100% Pure, Egyptian Black Seed Oil (Also known as Egyptian Black Cumin Oil) - Cold Pressed & Solvent Free in Black HDPE Plastic Bottle. Egyptian Black Seed Oil, 8 oz. Suggested Use: For adults, take 1/2 to 1 teaspoon per day, with meals, or as directed by a physician. Premium Black Seed Oil, 8 oz. Premium Black Seed oil is a valuable source of EFA"s 3/6/9"s and also contains two very powerful phytochemicals Nigellone and Thymoquinone along with other nutrients that work synergistically to support the body"s various functions. Contains: 100% Pure, Black Seed Oil (Also known as Black Cumin Oil) - Cold Pressed & Solvent Free - Amber Glass Bottle.